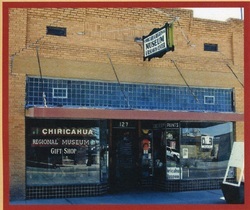 The Chiricahua Regional Museum, established in 1999, is maintained and operated by the Sulphur Springs Valley Historical Society, a non-profit organization dedicated to preserving the history of Willcox and the entire Sulphur Springs Valley from prehistoric times to the modern era. The focus of this museum, located in the old Valley Hardware store, is on the Apache Indians, the U. S. Cavalry, the cattle industry, the Southern Pacific Railroad and the many ethnic groups who contributed to the development of this region of Arizona. Few areas in our state can claim such a rich and fascinating cultural heritage. The museum is continually expanding its collection of artifacts, documents, photographs and other items of historic interest. Special events are held throughout the year including programs for school children to increase enthusiasm and awareness of local history. CRMRC is a western history museum honoring the peoples who created the rich cultural heritage of our region, through the collection, preservation, and exhibition of historic artifacts as well as archival, library andresearch materials. The region covers the geographic area where the Chiricahua Apache roamed. This includes east to the Animas Valley, south to Fronteras, Mexico, west to the San Pedro Valley and north to the Gila Valley. The focus shall be the time period from the arrival of the Spanish in 1540 to the present, but it may also include prehistoric artifacts. The main interests shall be the Apache Indians, military, early settlers, town histories, ranching and farming, railroad, mining, and the different ethnic groups who contributed to the building of this area. Visit our Gift Shop for a variety of gift items, our original publications, and books on the Chiricahua Apaches and southeastern Arizona history.